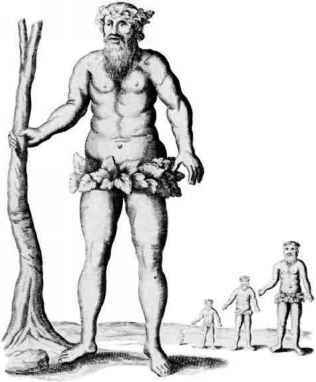 In Mundus subterraneus (1665), the Jesuit Athanius Kircher accepted the common idea that large fossil bones were the remains of giants but protested at the tendency to exaggerate their size. the muds and sands that contained them had all been swept north from their natural habitats by the Flood or Deluge. It is hard for us today to fully appreciate the mindset and religious 'wiring' that connected society throughout most of Europe and the domains of Christendom. For well over iooo years the Judeo-Christian Old Testament with its story of Creation and the subsequent Flood, as related in Genesis, was generally accepted as historical fact and, more than that, it was the word of God and therefore indisputable. Virtually all the major philosophers and naturalists, including revolutionary thinkers such as Newton, were at least Christian deists and often much more literal in their reading of the scriptures. We have to remember that as late as 1697, Thomas Aikenhead, an 18-year-old medical student in Edinburgh, was arrested for heresy. He was overheard repeating part of an 'infidel' tract and despite his recantation and plea for mercy was hanged. You did not meddle lightly with the received wisdom of the Church and Bible. I suppose all the surgeons in town have seen it, and I am perfectly of the opinion that it was a human tooth. I measured it, and as it stood upright it was six inches high ... and round 13 inches ... and its weight in the scale was 2 pounds and four ounces ... I am perfectly of the opinion that the tooth will agree only to a human body, for whom the flood only could prepare a funeral; and without doubt he waded as long as he could keep his head above water, but must at length be confounded with all other creature and the new sediment after the flood gave him the depth we now find. The tooth was not very convincing evidence and was in fact the molar of a mastodon, but in Europe new victims of the Flood were being uncovered. Cotton Mather, 1663-1728, a Harvard-trained American Protestant mystic involved with the Salem witch trials. Mather also founded Yale with a grant from a London merchant, Elihu Harvard. He pioneered innoculation against smallpox in America and became a Fellow of the Royal Society in 1713. 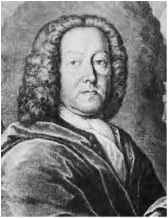 Johann Jacob Scheuchzer (1672-1733), a Swiss naturalist and physician who amassed one of the largest collections of fossils in Europe. His Herbarium of the Deluge (1709) and Physica Sacra (1731) portrayed natural objects including fossils within the context of the Judeo-Christian Old Testament. and that was the apparent lack of fossil remains of the human sinners who were also victims of the Flood. In 1725 Scheuchzer seized on the reported discovery of a human-like fossil in strata quarried for lithographic stone at Oeningen on the shores of Lake Constance in his native Switzerland. Excited by the find, he wrote to Sir Hans Sloane, a rich and famous English dilettante whose extensive collections later formed the basis of the British Museum. We have obtained some relics of the race of man drowned in the Flood ... what we have here is no vision of the mere imagination, but well-preserved bones, and in such number, of a human skull, quite clearly distinguished from the bones of other species. Sir Hans Sloane, 1660-1753, physician to King George II who trained in France and became secretary (1693-1712) then president (1727-41) of the Royal Society and was created baronet in 1716. His collection was purchased for the nation and formed the basis of the British Museum. sticking out from the side. But Scheuchzer's enthusiasm and desire to find a fossilised human 'witness' got the better of his critical faculties for the niceties of human anatomy. 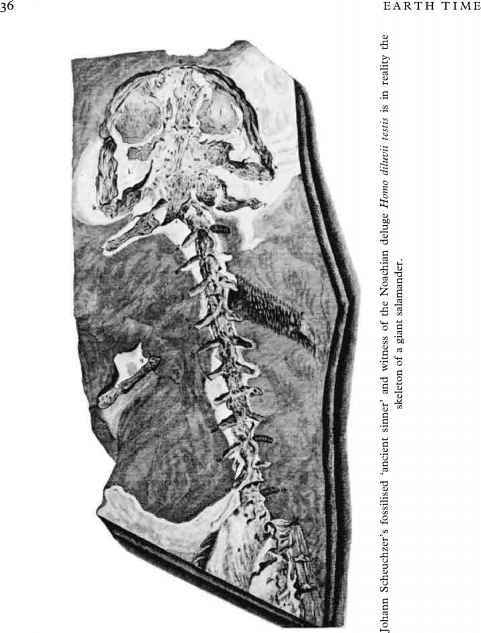 In 1809, Georges Cuvier used his predictive skills based on comparative anatomy to demonstrate publicly that the skeleton is in fact that of a large salamander (scientifically known as Andreas scheuchzerii). Cuvier was unusual in being a French Lutheran and generally made a separation between his science and his religion. Just as astronomers were bursting through the perceived limits of space, so Cuvier wrote in 1813, 'would it not also be glorious for man to burst the limits of time, and, by a few observations, to ascertain the history of this world, and the series of events which preceded the birth of the human race?' He interpreted the deposition of the fossiliferous strata of the Paris region as the result of a succession of catastrophic flood events, but he refused to speculate on their extent and origin. However, he suspected that they were not global, otherwise they would have required a succession of creation events to restock the life of the planet. Instead, he thought that there must have been refuges where life survived to repopulate the lands and oceans. But Cuvier did also believe that the catastrophic Flood, as recorded in the Old Testament, had occurred. For Cuvier this Deluge had indeed 'extinguished' the extraordinary mammal fauna that included such magnificent beasts as the mammoth and thus brought an end to the prehuman world. For Cuvier Thomme fossile n'existe pas', but what he did not know was that back in England a discovery had been made that presaged a revolution in the understanding of human antiquity. At a meeting of the Society of Antiquaries in London in 1797, it was announced that a Suffolk gentleman by the name of John Frere had found flint stones carefully fashioned in the shape of pointed axes. Frere argued that these flints from Hoxne in Suffolk were so well fashioned that they must have been made by the hand of man rather than by any accident of nature. The flintstone tools were found several feet below ground level, buried in sands and gravels from which the remains of extinct animals had also come. Consequently, Frere concluded that the humans who made them must have lived alongside these ancient extinct beasts and that therefore 'the situation at which these weapons were found may tempt us to refer them to a very remote period indeed, even beyond that of the present world'. The cracks were beginning to appear in the generally accepted prehistoric chronology, especially that of humans, but it was to be nearly another 100 years before human antiquity was finally accepted by the scientific community. John Frere, 1740-1807, a Fellow of Caius College, Cambridge, member of parliament, high sheriff of Norfolk and antiquarian who published the first description and illustration of an ancient stone tool as an object worked by human hand. But the idea that the Diluvial Period and its fossil remains represented the biblical Flood event was still very much alive and kicking through the first few decades of the nineteenth century. This was largely thanks to energetic advocacy by some well-placed and influential geologists in England, especially William Buckland. On appointment as Reader in Geology at the University of Oxford in 1819, the Reverend Dr Buckland gave an inaugural lecture entitled 'The Connexion of Geology with Religion Explained'. For Buckland one of the prime objectives of geology was 'to confirm the evidence of natural religion; and to show that the facts developed by it are consistent with the accounts of the creation and deluge recorded in the Mosaic writings'. The Earl of Bridgwater, Francis Egerton (1756-1829), a Fellow of All Souls in Oxford, gave £8000 for the publication of the best work on 'The Goodness of God as manifested in the Creation'. The money was divided between eight authors in what was to become known as the 'Bridgwater Treatises'. Buckland was an obvious choice to be one of the authors and took his task seriously. The Very Rev. William Buckland, 1784-1856, reader in geology at Oxford (from 1813), author of Reliquae Diluvianae (1823), the Bridgwater treatise volume on geology (1836), Canon of Christchurch (from 1825), Dean of Westminster (from 1845) and twice President of the Geological Society of London (1824 and 1839). William Buckland was one of the most influential and well-known geologists in England during the first few decades of the nineteenth century. Like Werner, he was a charismatic if sometimes eccentric teacher and lecturer who inspired many famous students of geology such as Charles Lyell. A Dickensian figure, Buckland was famous in Oxford for his menagerie of sundry pets, ranging from guinea pigs to a jackal that was occasionally to be heard crunching one of the guinea pigs under the sofa and a bear, named Tiglath Pileser, after the founder of the Assyrian empire. He also liked culinary experiments and claimed that he had tried eating most living things from mice to crocodile. Both at the University of Oxford and at the newly founded Geological Society in London, Buckland was famed for his rhetoric, often spiced with unusual demonstrations and examples. Eventually, as can so often happen, he became over fond of the sound of his own voice, something of a caricature of himself, increasingly irrational. Eventually Buckland descended into real madness. More importantly, Buckland was also a leader of the British theological geologists, along with clergymen such as the Reverend William Conybeare. They assumed that the investigation of the Earth's history would confirm the Mosaic tradition of the Flood as a major event. 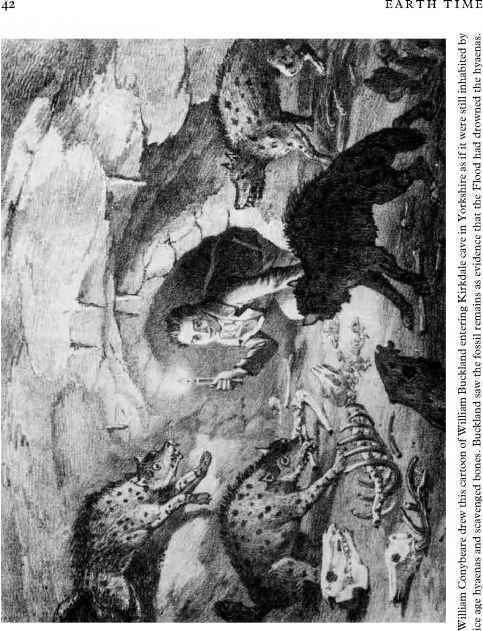 Buckland and his supporters searched for geological evidence of the Flood, expecting to find both sedimentary debris, drowned 'sinners' and remains of all the animals and plants that had inhabited the Earth. Culturally, catastrophism was in the air, with romantic ideas and images of revolution attracting both fear and fascination in the minds of poets, writers and artists. William Conybeare, 1787-1857, Dean of Llandaff (from 1845), geologist and coauthor, with W. Phillips, of Outlines of the Geology of England and Wales (1822). 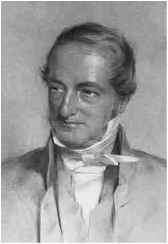 He was a major contributor to Greenough's geological map and pioneered the investigation of extinct marine reptiles. The poet Byron's (1788-1824) preface to his drama Cain, published in 1821, spells out his clear understanding of catastrophism as promoted by Cuvier. The reader will perceive that the author has partly adopted in this poem the notion of Cuvier, that the world had been destroyed several times before the creation of man. 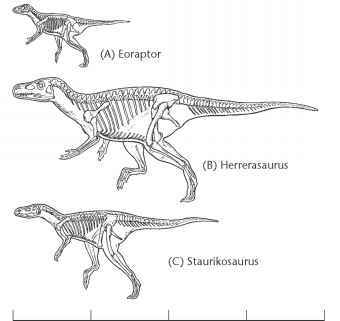 This speculation, derived from the different strata and the bones of enormous and unknown animals found in them, is not contrary to the Mosaic account, but rather confirms it; as no human bones have yet been discovered in those strata, although those of many known animals are found near the remains of the unknown. William Wordsworth, 1770-1850, the famous Cambridge-educated (1787-91) poet laureate (from 1843). He renounced his early revolutionary sympathies and became deeply concerned with landscape, especially that of the Lake District and its inhabitants, where he lived from 1799. Through his brother Christopher who was master of Trinity College, Cambridge, he met Sedgwick and asked him to write a geological introduction to his A Complete Guide to the Lakes, 1842. The aspirations and excesses of the French Revolution were still very much in the popular imagination. A series of monumental canvases by the English artist John Martin (1789-1854), on historical and biblical themes such as The Fall of Babylon (1819), The Destruction of Pompeii by the Eruption of Vesuvius in AD 79 (1822) and the Deluge (1826), attracted hordes of viewers when publicly displayed. The Deluge was so popular that Martin issued mezzotint copies for sale in 1828.
the Flood had occurred between 5000 and 6000 years ago. Not surprisingly, this age conveniently coincided with the generally accepted date of the Flood. Buckland presented his results in his 1823 book Reliquae diluvianae; or, Observations on the Organic Remains Contained in Caves, Fissures, and Diluvial Gravel, and on Other Geological Phenomena, Attesting the Action of an Universal Deluge. For Buckland, the geological detail 'by affording the strongest evidence of a universal deluge, leads us to hope that it will no longer be asserted as it has been by high authorities, that geology supplies no proofs of an event in the reality of which the truth of the Mosaic records is so materially involved'. With his blinkered passion to reveal the 'true' nature of the geological record of the Diluvium, Buckland could not see any contradictory evidence. The most famous of his missed opportunities was his 'reading' of the evidence he had found in Goat's Hole Cave, Paviland in South Wales. From 1822-3 Buckland excavated layers of cave deposits in which he found a complete human skeleton, numerous stone tools and ornaments made of mammoth ivory, all buried below the surface deposits of the cave. The human skeleton had clearly been purposefully buried in a shallow grave with the ornaments and then dusted with red ochre (a naturally occurring oxide of iron). The scattering of ochre and placing of the ornaments suggested to Buckland that the body had been buried with some ceremony. Buckland was a very acute observer, concerned with accuracy, and he produced a detailed description and plan of the find. From his examination of the skeleton, he could find no significant differences from the modern human frame. However, he mistakenly thought that it belonged to a young woman and it has been known as the 'Red Lady of Paviland' ever since, although it is in fact a young male, aged about 25 and 1.7 m (5 ft 6 in) tall. Although Buckland knew that the mammoth was an extinct animal commonly associated with Diluvial deposits, he could not make the connection between the presence of ornaments made of mammoth ivory and a contemporaneous age for the skeleton. Instead, he had to produce an unnecessarily complicated story to explain the facts. Accordingly, the 'woman' was from a Welsh tribe who lived and died during the Roman occupation of Britain. Her relatives had buried her in the cave where they found the ancient 'fossil' mammoth tusks and made them into the ornaments that they then placed in her grave. We now know that the skeleton is around 26,350 ± 550 years old and that he was one of the Cro-Magnon people who first migrated into western Europe around 40,000 years ago. There was no way that Buckland could have known the age in years. But he missed the chance to become the first person to find and describe the remains of our most immediate human relatives, who made stone tools and did indeed coexist with the animals of the Diluvium as John Frere had claimed. Buckland's sincere attempt to reconcile the Old Testament account with the emerging geological facts further delayed the recognition of the scientific facts of the matter. However, Buckland was not a dogmatic fundamentalist. Continental geologists were about to cause a major upset in the interpretation of the Diluvium. Are there human remains in diluvium?